Don't Forget To Refresh Yourself! I'm excited to share with you my new e-book, The Birthday Wall, which is a detailed, step-by-step instructional book I've written that shows how to create a multi-dimensional, colorful visual collage to help celebrate your Child's birthday! As creator of this family tradition, I share how to research, plan, gather, create, and display all the elements of your child's Birthday Wall, which can enable you to validate, affirm and show appreciation for your child with who they are right now. You can buy it here on Amazon or here on Smashwords for just $2.99. Do you have a happy place in your work life? Is there a spot in your office or cubicle where you can show the things you love the most? It may not take a whole lot to create such a spot: perhaps a few visuals, your favorite colors and one of your favorite things can be a start. Put some happy where it counts to inject some positive energy into your work life perspective. Happiness is to know that where you reside gives you a fresh perspective no matter what kind of day you've had. Be sure to create havens in several places in your home space to nurture your soul and validate your value. Perhaps some colorful throw pillows, an antique or special gift from a friend that always cheers you up. It's often the little things in life that help you create the happy vibe that puts a smile on your face. Detailing those significant life moments, those delightful shifts, can help you unveil what makes you happy. Q: Does Journaling help you capture significant life shifts in perspective? When I feel a shift in my perspective, I am eager to write it in detail; this often shows my authenticity and what activated my personal power. You're welcome to join me in a new journaling exercise for your emotional awareness that I published in Outlet E-zine and am actively engaged in with my journaling practice. You're welcome to share your discoveries by replying to this issue of Refresh Journal! You're welcome to reply to the weekly journaling question; I may share it in a future edition of Refresh Journal. You're welcome to subscribe to my blog Refresh with Dawn Herring so you will always get my latest posts in your email to read at your convenience. Have you ever experienced a significant shift in the way you express yourself artistically? Watercolor has not always been my mode of medium as an artist. In fact, I've only engaged in watercolor for 2 1/2 years as an artist. But I find, as a life-long artist, that it doesn't matter what medium you choose. As long as you're being true to yourself, you know you're on the right track. I've always had a fascination with watercolor and have admired pieces of art in the past. I just never decided to try it for myself. Until I started in 2011. That's a creative, artistic shift I can be HAPPY about! "In life, decide what you give your energy to. Your energy is creating your life." "Dawn, Just read your article on authentic voice; Loved it! I'm a memoir writer. It really hit home. Thanks." Your Happy Place. Makes you smile, doesn't it? I know when I think of my Happy Place, that's where I want to go! Mine are in my art studio where I paint, create, imagine, dream, and paint some more. I also enjoy going outside in the evening to check out the moon. Or listen to my mocking bird in my front driveway and watch his trilling neck vibrate with beautiful sound. Or when I pray/meditate and find myself centered, content, satisfied. We all want a place that makes us happy. But how aware are we of what and where we are happiest? Perhaps clueing in on those significant life shifts, ones that show us who we are and what matters to us, can gives us an idea of what and where makes us really happy. We discussed how we can use our journals to detail our significant life moments, those shifts we experience, that reveal our Happy Place to us during our recent session of #JournalChat Live with special guest, Juliet Platt. Our topic was Your Journaling: What Makes You Happy. Highlights are below. "Do You Recognize Your Authentic Voice?" is my latest guest post published on Kathleen Pooler's Blog. Do you have a message that resonates with you right now? Something that you would love to have right in front of you as an empowering reminder of who you really are and what makes you happy? Check out my message card sample at the Dawn Herring Collection Art Gallery, and send me a direct email to order an artistic display of your favorite power message in your favorite colors. Also included this week are refreshing tips for your work and your home and one of my favorite songs by The Carpenters, "Top of the World." Your Authentic Refreshment can help you find your happy place. And thank for making Refresh Journal part of your happy place. **This link has been chosen for Pick of the Week; please read about this week's #JournalChat Live topic in the box below. Some decisions are made without very much thought. But there are some decisions that feel down right grueling and intimidating due to the unknown factors. How can we go about making decisions with less stress and more confidence? Mari shares some fabulous journal writing tools that can help us dig deeper into our "deep intelligence" as she terms it, to help us create a confident and assured vibe in what we choose for our lives. From free writing to pros and cons to a different perspective for each choice, she offers some great strategies to help us get on the right decision-making track so we'll conclude with confidence. For this week's #JournalChat Live, we will discuss how we can use our journals to make those more challenging and even intimidating decisions so we'll know which way to go. Our topic will be Your Journaling: Go Deep with Decisions. You're welcome to read this post prior to the Live chat on Thursday, and perhaps write an entry about how you could use your journal to make decisions with confidence and less stress using effective journal writing tools. You're welcome to share any discoveries you've made during our chat. So join us on Thursday, August 1, 2013 at 5 p.m. EST (2 p.m. PST) for #JournalChat Live on Twitter. Be sure to use the #JournalChat hashtag in your tweet! Our topic from our most recent session of #JournalChat Live was Your Journaling: What Makes You Happy as we discussed using our journal to detail those significant life moments that unveil our truest happiness. Highlights are below. Often what really makes us happy surprises us-it's not what we might initially believe. [That shift toward our center] may also be thought of as intuition, or a happy surprise! Our unconscious self is so different from our conventional every day self - and notices many different meanings in things. The feeling of connection and of being on the same wavelength is beautiful. Reflective life is like stringing together our beads of experience to make up a whole necklace unique to who we are. The word important actually refers to something brought in - so journaling helps us examine what our experience brings us. We need to develop a sense of knowing what is authentic for us - and this is often in our bodies. By inquiring of the important things in our day we can detect both happy and sorrowful shifts. We don't often realize when a significant shift has taken place; we may feel a little different, but why? I notice this often when I am working/playing in my art journal, whether it's a color or word choice or a discovery. Intuition is one of the Key Dimensions of life concerning learning about ourselves. We may also note this significant shift or feeling when we have a conversation with someone. Reflection is a vital part of discovering the essence of what makes life worthwhile which can be truly motivating! What significant life shift, what Gift, are we receiving that can help us uncover what really matters? Each awareness stretches that band of authenticity just a little more, doesn't it? We need to embrace change rather than consider it always the enemy. 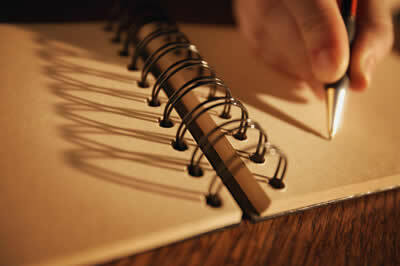 Journaling is [a] great tool for mindfulness. It draws our focus in to our emotions and thoughts. What makes me happy is waking up every morning and knowing that my journal is there for me to talk to no matter what! Keeping a journal out throughout the day helps me cope with life. I also try to write a final entry at night. It helps me sleep better and I have great dreams. Journaling has helped me find my voice. It's helped me find myself. As we journal our days, we can deliberately choose to detail those life shifts that reveal who we really are. See what journaling your life shifts will do to enhance the quality of your life! Check out the transcript for #JournalChat Live on 7/25/13. Special Thanks to Juliet Platt for her fabulous post, Happy Beads, which was our journaling resource for this week's live chat. Join us on 8/1/13 at 5 EST/2 PST for our next session of JournalChat Live. An Authentic Refreshment is one that enables you to appreciate yourself for who you really are, validate your emotions and feelings, and nurture your soul. Your Authentic Refreshment, I am featuring interviews from folks who have found and engage in their authentic refreshment and how it enhances and adds value to their daily life experience. Very Good Friend, True Turner, Musician, Composer, and Performer, is our newest interview on Your Authentic Refreshment. Be inspired! If you have an authentic refreshment you would like to share, please reply to this issue of Refresh Journal and I will give you the details! STILL LOOKING FOR YOUR AUTHENTIC REFRESHMENT, I HAVE GOOD NEWS FOR YOU! For $75. you will be able to ask questions, set goals, activate your intuition and give space for your refreshment all under the structure and guidance I will provide as Your Refreshment Specialist. Just click here for more information on my website and to purchase a Refresh Session! Love is the Perfect Happy Place. As you pay closer attention to those daily life shifts in perspective and find your happy place, encourage a friend to find theirs too. Then spend time there to help you gain a fresh perspective in your life dimensions. Our Happy Place can add a dimension of happiness to our friendships as well.